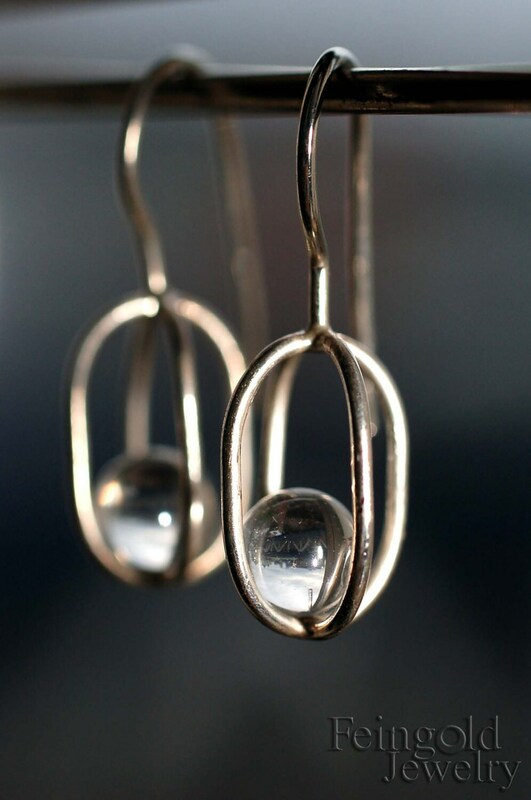 These earrings are each comprised of a single handmade polished sterling silver cradle containing a transparant crystal quartz sphere. The gem stone floats freely in the cradle, adding a gentle unique movement to your ear. I create each cradle through traditional metalsmithing techniques of sawing, forming, hammering, and soldering sturdy sterling silver wire. I shined the sterling silver cage to contrast the delicate stone. The earrings each measure approximately 7/8 inch (2.2 cm) long from the top of the ear wire to the bottom of the cage and the cage itself is 1/4 inch (0.6 cm) wide. The earrings feature a very tiny clear crystal quartz. Clear quartz crystal makes a great gift for someone born in April. Please note, the movement of the stone in the cage results in a slight sound.